Every now and then you need to Rage Against The Machine, pull a Crazy Ivan, be independent. 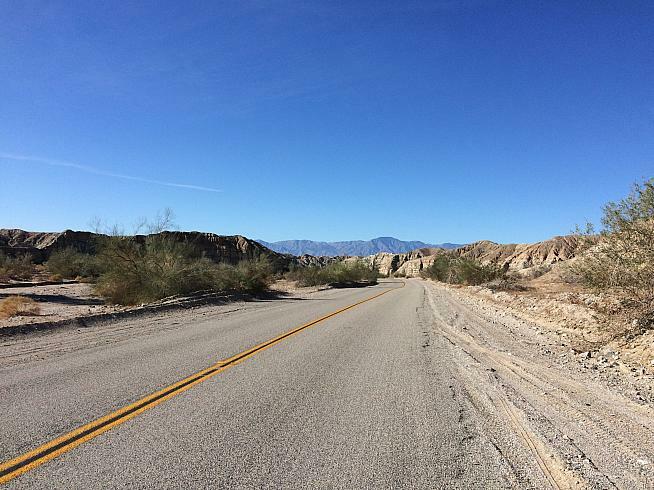 Rather than head over to the Tour de Palm Springs and join 10,000 riders rambling through California's beautiful Coachella Valley on a February morning, I'm skipping the corporate industrial pay-per-mile gran fondo scene and striking out on my own - riding indie. A week riding around Coachella Valley in full defensive cycling mode, breathing fine European luxury car exhaust and racing from stoplight to stoplight is taking a toll on me. Today, I need an epic bucket ride to detox body and mind. So, I design my own gran fondo-sportive-century-radmarathon-brevet or whatever-you-want-to-call-it bucket ride, an out-and-back from the center of Coachella Valley to Joshua Tree National Park. 106 miles highlighted by tall mountains, blue skies and wide-open desert vistas, plus no old guys in Bentleys aiming to run me over while texting to set up a tee time. 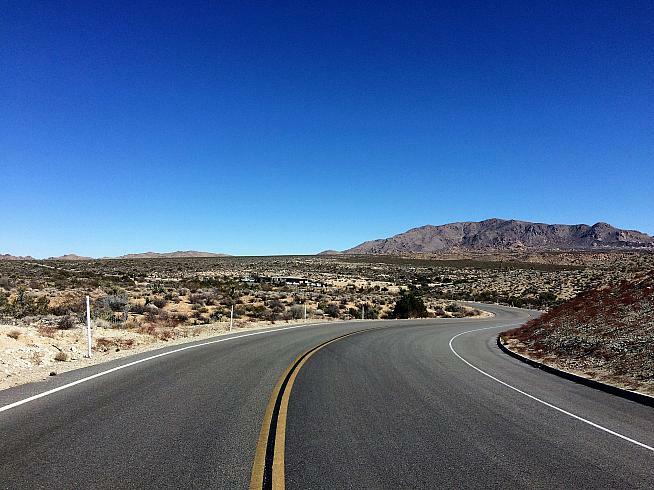 The route is simple, start in Indian Wells and follow the edge of the Santa Rosa Mountains to Mecca before climbing into Joshua Tree National Park. Turn around and do it reverse. If you're a free spirit looking for a free ride this is just the ticket. 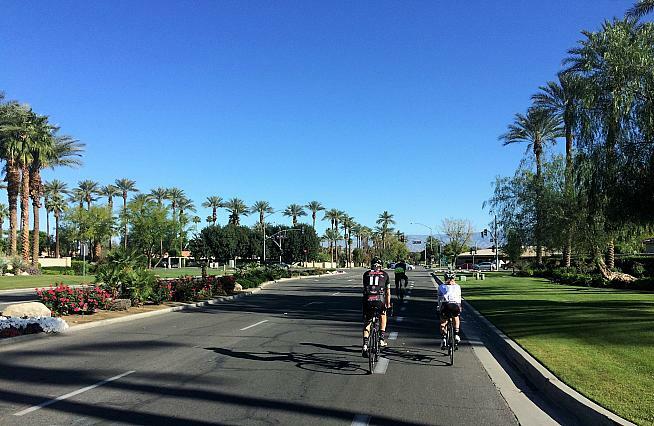 - After loading up with high-octane fuel at Indian Wells Coffee (bucket rides always start with awesome coffee) roll down the Highway 111 bike lane towards La Quinta under stately palm trees and next to beautiful manicured gardens. 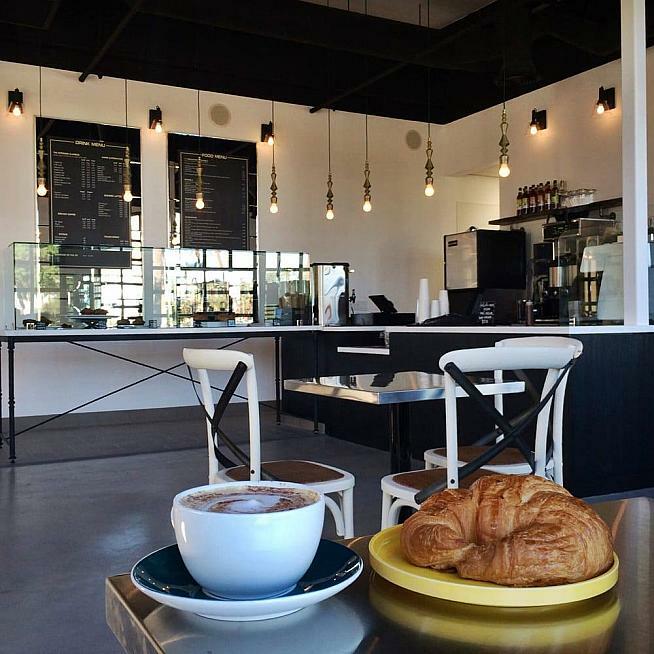 - Turn south at Washington Street and continue in the bike lane, cruising through the heart of La Quinta while checking out the rugged Santa Rosa Mountains. - After a few miles Washington Street ends and the route turns east on Avenue 52, heading past more golf courses (they are everywhere) and through a roundabout till reaching Madison Street. Off to your left is the Empire Polo Club where the envy-of-every-teenager Coachella Music Festival takes place in April. I hear it's a big thing with a couple hundred thousand young people coming together for music, art and to parade around in a world of stylized desert hippiedom. - Turn right on Madison Street past flowering gardens and walls tall enough to keep riffraff cyclists at bay. With wide smooth bike lanes, it's a nice place to pick up the pace or stop and pick a roadside orange. - At Avenue 60 turn left and ride past Trilogy, the last golf course oasis. This is a popular route with cyclists and for a few miles I jump in with The Boise Boys, a group of Idaho cyclists in town for winter training camp. - Soon the bike path ends, turn right on Monroe Street, then left on Avenue 62 riding on lightly traveled roads through fields of citrus and date palm. - At Jackson Street (yes, north/south roads are named for Presidents) turn right and head into the heart of date palm country. 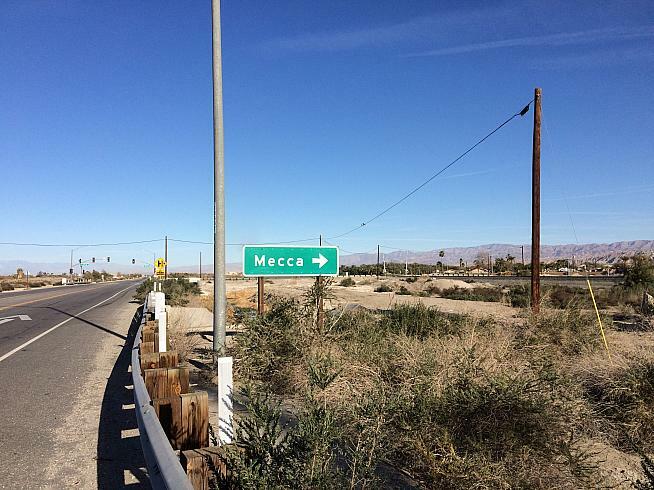 Jackson soon turns east and becomes Avenue 66, taking you past the Fish Traps Archeology Site and to Mecca - grapefruit capital of California. - Seven straight miles down Avenue 66 is Mecca, including a convenience store at Highway 86. This is the last water stop until the ranger station turnaround in Joshua Tree National Park - 28 miles. It is also the low point of the ride at 187 feet below sea level. From here there are no stop signs, stop lights or cell signals for 56 miles until you arrive back here. - Leaving Mecca, the route heads up Box Canyon on a 2% climb for 20 miles. It's not hard, but gravitational forces continually remind you it's uphill. Enjoy breathtaking canyon views of giant earthen plates tossed around by the San Andreas Fault underneath you. - The final climb to the ranger station starts at Interstate 10. It's 8 miles at 3-4% straight up into the Cottonwood Mountains. After the first mile, stop and snap an obligatory selfie at the official Joshua Tree National Park sign. - You'll find water, bathrooms and friendly rangers, but no food up top at the ranger station. Bring a wind jacket, knee/leg warmers and gloves since the temperature at 3,000ft is 10-15 degrees cooler than Mecca and the fast 28-mile descent is chilly, but only takes about an hour! 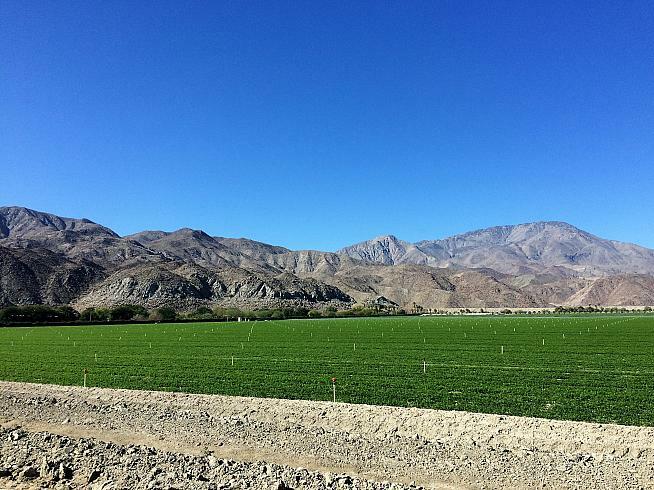 - There are several scenic vista turnouts on the return with wonderful panoramic views of Coachella Valley. 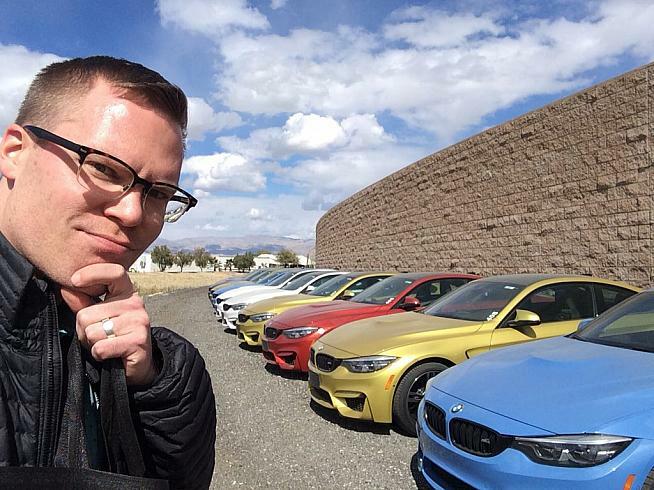 At one I meet freelance automotive journalist Nick Kurczewski test-driving the latest not-yet-available-in-the-states shiny high-tech BMW with luxury leather lounge seating. He is smiling, having fun, a lot of fun while I toil in the desert on a 10-year-old bike with dull peeling paint and a hard faux-leather seat. Hmmm, maybe time to pivot and switch to freelance auto journalism...zoom, zoom. TOUGH DECISIONS FOR FELLOW JOURNO NICK. CREDIT: NICK K.